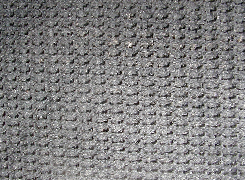 Rough Top Impression belting is one of the most popular impression patterns in the belting industry. It is used to carry everything from boxes to lumber. LEGG Company offers several different constructions for your conveying needs. With LEGG Company’s wide range of carcass and compound selections, you’re sure to find one that fits your needs. For the different carcass selections we offer natural, natural/synthetic, and all synthetic compounds which fit the ever increasing demand for belt performance.